As I go through my house yet again, I continue downsizing. What I have removed, I no longer need or want. I am beginning to revel in less, much less. Although I have not been able to condense my kitchen tools to one drawer, I am still happy with what I am discovering about less. It is not a burden nor a deprivation. As we give up our large space which housed several children, we no longer need to provide for all that activity. Our own activity takes place in about 600 square feet. So, now we are planning for other alternatives. Living tiny is allowing us to travel. Living tiny is allowing us to develop other businesses. Living tiny is allowing us to make other connections with other people in other places. 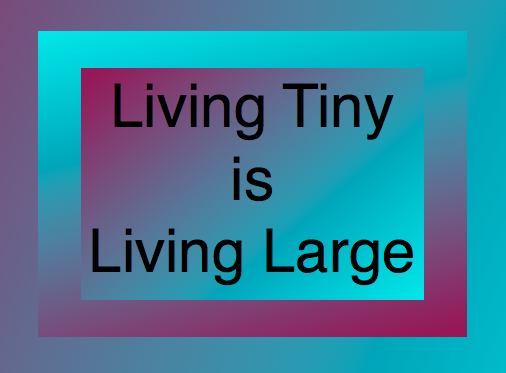 Living tiny is living large.